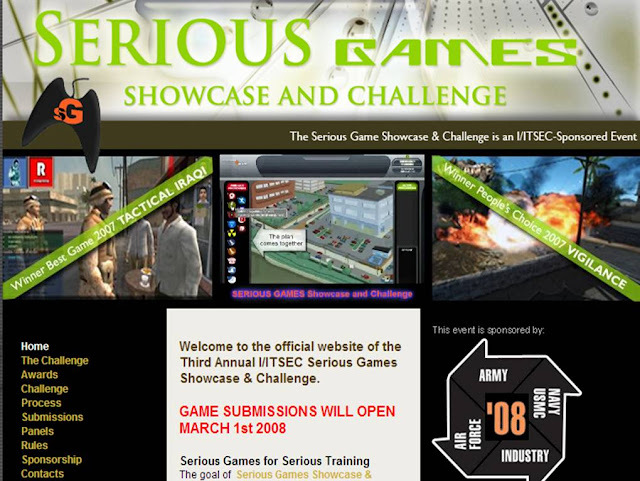 The goal of Serious Games Showcase & Challenge is to identify innovative game-based technologies and solutions that improve training across all segments for individuals, groups and systems. Submit your original serious games entry and have your work reviewed by a panel of military, academia and industry gaming experts. Finalists will be showcased, and winners announced, at I/ITSEC 2008 to be held on 2008 Dec 1-4, at the Orange County Convention Center on International Drive in Orlando, Florida. Whether you’re an individual, small business or big business – the Serious Games Showcase and Challenge is open to you! Submissions can be targeted to training in any segment, including education, corporate, or military. If game development is your past-time, your intended field, or your current business… If you can "mod" a game into a training solution, or program one from scratch…consider how you would use your skills to develop a serious game solution to enhance training. In 1979 it became known as the Interservice/Industry Training Equipment Conference. The Services have steadily evolved toward a total systems philosophy in the acquisition of training equipment and training delivery systems. The Tactical Iraqi Language & Culture Training System™ teaches how to communicate safely and effectively in Iraq. Language training covers mission-related spoken vocabularies and pronunciation. Cultural instruction teaches the non-verbal gestures and the norms of politeness and etiquette critical for successful communication. Trainees play fun, immersive 3-D videogames that simulate real-life social communications involving “intelligent virtual humans” that recognize the trainees’ speech, gestures and social behavior. If trainees speak and behave correctly, the virtual humans cooperate and let the trainee advance; otherwise, they prevent trainees from “winning” the game. Over 15,000 U.S. warfighters have successfully taken the course to date. Vigilance™ provides a controlled educational experience, exposing players to both visual and verbal instruction on the specifics of IEDs. As players gain experience, they are asked to locate and identify IEDs among increasingly complex surroundings. To facilitate instruction and minimize the time to “learn the game,” a highly interactive user interface was developed which includes a HUD type display. Following the instruction and simulation portion of the game, in-game performance is tracked, exam questions are administered and remedial information is provided. Vigilance™ is powered by Crytek’s CryEngine2™ gaming engine and Scaleform’s GFx™ software was used to produce the user interfaces.